The apartment was very clean and cool which was just perfect. The shower room was clean and a good size. Outdoor tables & chairs were used for breakfast & late afternoon. The welcome pack was much appreciated and Markela couldn’t have been more helpful. She even gave us a lift to the bus stop on the edge of the village. We’d love to come back though I would prefer one of the larger apartments which had more of a view. Actually reality exceeded our expectations, because the owner of the apartment didn't have the room we've booked and gave us HUGE two-floor apartment. It was just great with a splendid sea view. Communication with the owner was OK in spite that she left her mom to meet us and give keys. Beach near the apartment was great, but It wasn't relevant for us, because our aim was to visit a lot of different beaches over the Crete. Room was clean and quite large with fridge, cooking ring, dishes and cutlery. There was easy access to shops and restaurants, many of which were very good. The village of Panormo is typically Greek and the villagers offer wonderful hospitality. It is great to see young children freely and safely playing about on the streets around the restaurants' tables and chairs on the street. There was available, access to a washing machine. The view of the sea was wonderful. Great location, very clean, beautiful sea views, nice terrace. Markela the owner was really helpful, water, wine, biscuits and fruit in our room on arrival. Would go again. Der Service der Gastgeber war besonders höflich, freundlich und auch sehr herzlich. Gute Verständigung mit Englisch. Wann immer wir ein Anliegen hatten (wir haben uns einmal ausgesperrt) konnten wir sofort jemanden erreichen und uns wurde freundlich geholfen. Die Handtücher wurden gewechselt und es wurde zwischendurch gereinigt. Taxiservice vom/zum Flughafen per Festpreis hat perfekt geklappt, obwohl wir am Abend vorher erst gebucht hatten. Die Lage ist nicht zu übertreffen: gefühlt 30 Sekunden zum Strand, zum Supermarkt oder zum nächsten Restaurant. Toller kleiner Ort mit allem, was man braucht. Von der Terrasse / Apartment hat man sehr schönen Meerblick. Die Familie ist wirklich sehr nett, wir wurden mit kühlen Getränken im Kühlschrank zur Begrüßung überrascht! Insgesamt zwar kein Luxusresort :D, aber wer das nicht unbedingt braucht, hat eine funktional eingerichtete Ferienwohnung hier in Top Lage. Wir kommen wieder! Путешествовали по Криту в течении месяца, Панормос был последним пунктом нашего путешествия. Апартаменты лучшие по расположению, удобству, сервису. Пляжи, магазины и рестораны в шаговой доступности. Обязательно вернемся еще. perfekte lage - ruhig, blick aufs meer, supermarkt, taverne, strand nicht weit weg; nette gatsgeberin, alle zwei tage wurde gründlich geputzt, dank klima und bequemen bett konnte ich herrlich schlafen. L'accueil familial très chaleureux.. Une seule personne parlait anglais.. c'est un beau petit immeuble face à la mer.. Nous avions un petit studio très bien équipé.. Le prix était tout à fait correct (40€) Il y a plusieurs appartements de taille différente. Super Lage zum Meer. Kurze Fußwege zum Strand und ins Ortszentrum. Balkon mit schönem Meerblick. Sehr freundliche und zuvorkommende Gastgeberin! Lock in a great price for Apartments Christina – rated 9.1 by recent guests! One of our best sellers in Panormos Rethymno! Located in Panormos fishing village, 150 feet from the sandy beach, Apartments Christina offer self-catering accommodations overlooking the Cretan Sea. The fully equipped kitchens feature cooker and fridge. The owners can arrange airport transportation services upon charge. All air-conditioned units at the Christina include satellite TV and free WiFi access. Bathrooms are equipped with hydromassage tub or jet shower. Maisonettes and apartments also feature furnished balconies and a sitting area with fireplace. The village of Panormos has a good selection of traditional taverns, shops and water sports facilities. 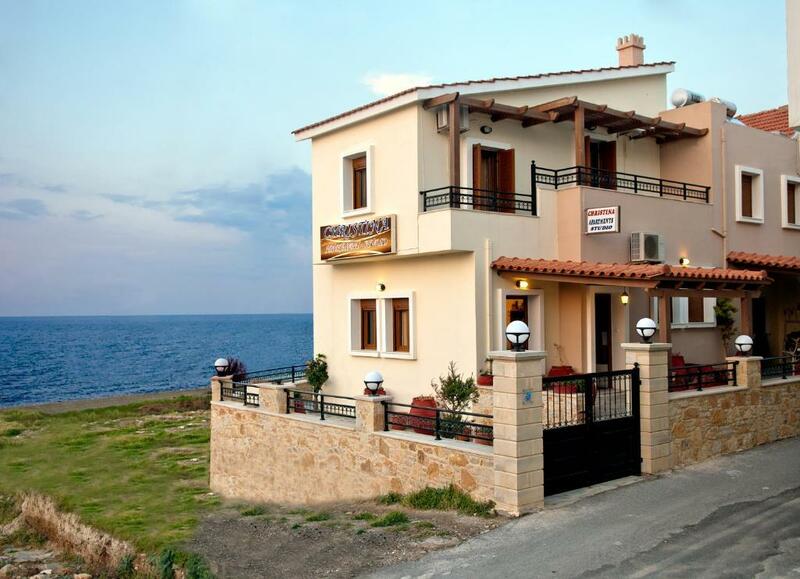 Christina Apartments is 11 mi from Rethymno Port and 37 mi from Heraklion Airport. Free public parking is possible at a location nearby the Christina. When would you like to stay at Apartments Christina? This room features bathroom and a yard with sea view. Please note that for the winter period heating is upon extra charge. This apartment features one twin or double bedroom and sofa in the living room area. It opens to a terrace or a small balcony with sea view. This two-story apartment offers a large balcony with sea view. It includes 2 bedrooms, 2 bathrooms, one with spa bath, and seating area with fireplace. This split-level apartment features 2 bedrooms, a living room, 2 WCs and a fireplace. It has a balcony with town views and windows with sea views. Hello!! !My name is Markella Parasiri and I am the owner of Apartments Christina. House Rules Apartments Christina takes special requests – add in the next step! Apartments Christina accepts these cards and reserves the right to temporarily hold an amount prior to arrival. Please note that for the winter period heating is at extra charge. Please inform Apartments Christina of your expected arrival time in advance. You can use the Special Requests box when booking, or contact the property directly using the contact details in your confirmation. The living room area was a bit gloomy, but not really a problem as we sat outside. The private courtyard with a view of the sea. Hard to find any negatives perhaps room a little small.